Please note that the school hours on Monday, April 22 will be from 9am to 12:30 noon. 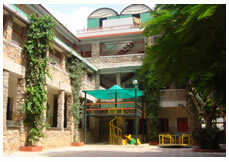 As a community of learners, The Junior Study was started in 1994 in Udaipur as a co-educational institution with a view of providing broad educational opportunities to children. The Junior Study is committed to providing a safe and happy atmosphere, and a well-maintained environment for children of ages 3-11 years. Just as a small drop of water makes its contribution in the formation of a mighty ocean, our school, too, tries to help in promoting the vast area of education to achieve the goal of creating good citizens and consequently a better society. We do not boast of being "The Best" but we do boast of "trying our best" to inculcate good values, foundations of which are laid in the early years. 'God, who touches earth with beauty, make me lovely too.' It is a simple philosophy. Effort is made to see that every child who comes to the school is helped to become a lovely human being. We expect that all the pupils behave in a manner, which is acceptable and appropriate under the given circumstances.